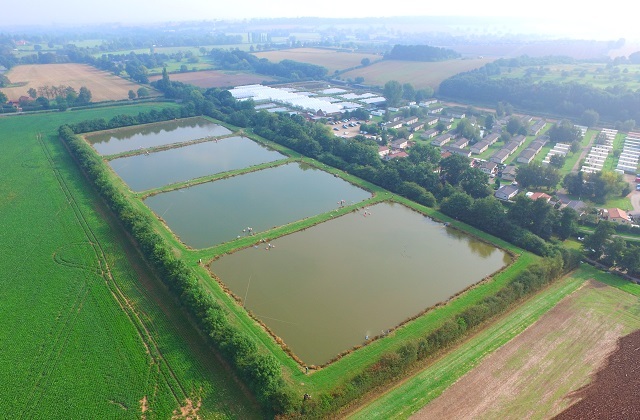 Calverton Fish farm near Nottingham is a crucial part of the Environment Agency’s toolkit for improving fisheries around the country. As the weather turns colder and many anglers start thinking about hanging their rods up for the winter, staff at the farm enter their most exciting period as they look to release fish into the wild. Alan Henshaw who runs the farm tells us about the stocking work his team have been doing around the country. As Team Leader for the fish farm it gives me immense pleasure to see the fish we produce helping regenerate populations in rivers the length and breadth of the country. The team at the farm spend the year breeding and growing on quality, pure bred, disease free fish which we stock out into the wild in the run up to Christmas. This is because water temperatures are low and this minimises any stress on the fish we release and ensures the best possible survival rates. It would be counterproductive to stock hatchery fish on top of healthy natural stocks so we don’t stock in every water around the country. Instead we take a science based approach with fish going into rivers which have been hit by pollution or where surveys show us that natural populations could do with a boost. Many of our industrialised rivers have improved dramatically in water quality over the last 30 years and it is here that the fish we introduce can make a significant and lasting difference to fish populations and angling for years to come. In addition, we do valuable work helping still water populations to recover after fish have been lost and also help in the development of new fisheries in areas where there are limited opportunities for young and disabled anglers. Over the past 3 years we have also been working closely with the National Crucian Conservation Project by breeding and supplying genetically pure fish for stocking into specially selected ponds throughout the country where they cannot interbreed with carp or other fish. This will help ensure the survival of true crucian carp for generations to come. My team and I are always working to improve the quality of the fish we produce so this year, we reduced the numbers of fish in each of the ponds. These lower stock densities meant the fish had more room to grow and less competition for food. This has resulted in much bigger fish with an average increase in weight of almost 40%. I am really pleased with the results and these are on average, the largest fish we’ve ever produced at Calverton. Their increased size means that they will have the best possible chance of survival. 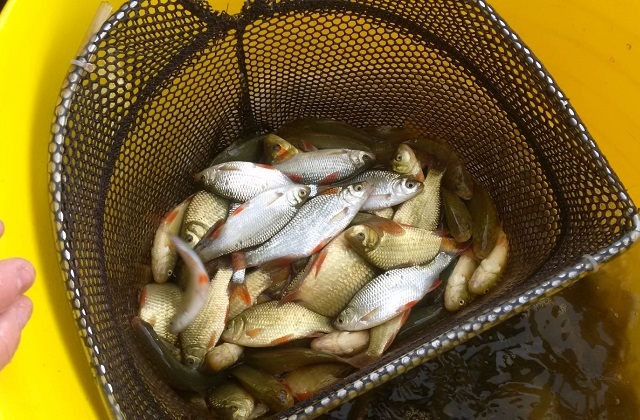 Fish from Calverton have been stocked across the whole of the country in places where our surveys have shown they will deliver the greatest benefit to stocks and angling. Is the clean water story as much to do with all are industry shutting down? So, nothing at all for private fisheries and nothing at all for any where that I fish, we do not have course fish rivers where I live but I still have to give my money as a tax to the EA so that clubs and river anglers can get the benefit of what the EA do. I only ever fish on private fisheries, which are businesses and these businesses get nothing at all from the EA. private fisheries make loads of money from people like you who pay maybe £5 or more a day to fish these places also spend a lot on restocking if they didn't you would stop going, I pay £20 per year to my club for a full years fishing. dear sir i fish my local river dane in cheshire, i have fished this river for more than 50 years in that time i have had some wonderful fishing, BUT over the last five years i have watched it slowly decline this year has been the worst i can remember, i keep a diary of my catches so i am not guessing, i do a lot of barbel fishing the last time a barbel crossed my net was 1st nov 2016, but its not just barbel that have disappeared there are no small fish no chublets no dace roach or even gudgeon , the only fish we see caught are grayling big chub or big barbel but even they are in decline its not just me all the other regulars are saying the same, we know there are predators on the river we have seen mink otters and odd cormarants on the river its only a small river and it cant cope with it all, could you please look into this problem i dont know when it was last stocked with small fish but it must be a long time ago. thank you for all the work you do please send some this way. I quite agree with your comments David, I have fished the river Dove for over 40 years & in the last 10 years have seen a rapid decline in fish numbers, (Especially the last two years) As you rightly point out we rarely catch any amount of small chub, roach, grayling or any amount of Barbel, if I'm lucky I can catch the odd big chub or barbel (If I'm really lucky) but that's about it now days. I have fished for 55 years and I gave up 18 months ago as the fishing in my part of Essex as got so bad and it can only get worse nobody will stop the main problem of eastern Europeans tacking fish from lakes and rivers. I have seen them with buckets of fish and reported it to bailiffs and the answer I got was he was too afraid to do anything. I have called the police when I saw 5 eastern Europeans with a inflatable boat and nets the police come and made them take it out of the Walter and left as soon there were gone the boat went back in the water. I am a member if the Tenchfishers. I would like to sincerely thank you for your efforts in supporting the group's Tench Heritage Alliance re-stocking efforts at Sywell Reservoir. I am sure that the EA staff directly involved are aware of our gratitude and I wish to extend my personal thanks to the EA generally. you do not say where you have released the fish Alan. maybe there are too many to list. does your map have East Yorkshire on it? There is a little back water of a river known as the River Hull that could do with a looking at. For Kevin who mentioned the River Hull. The Agency have stocked the River Hull for a considerable number of years with chub and barbel, in the past mainly in the tidal reaches. The barbel stockings started to show considerable success at Tickton, Weel, Dunswell, etc until a couple of seals appeared and they caused significant damage to the barbel and pike stocks in the tidal reaches. Some small barbel are again showing in 2016 catches in the tidal from the more recent stockings. The Agency recently stocked barbel, chub and bream above Hempholme weir and and at Beverely Shipyard in 2016. Grayling, dace and chub have also been stocked in the non-tidal in recent years. The Calverton guys are going a fantastic job. No but they get all the money that you pay but don't spend it on the fishery, and you blame the EA for this, think you need to take a closer look at where you fish mate. I live local to you and have always wanted to visit the fish farm, do you have open days or accept small groups of visitors? Hello, thanks for your interest in the fish farm. Due to biosecurity we don’t run the open days that we used to in the 1980’s and we try and restrict access onto the farm as much as possible. Has the River Mersey (Didsbury - Chorlton - Sale - Urmston) ever been stocked. It is a beautiful stretch of river but seems completely devoid of life (and anglers) which is a shame as I would love to able to take my grandkids (who love fishing) to this safe local stretch of river. Could this stretch be considered for stocking? I wish they would improve the river lark. It's totally empty on large stretches and dace have become extinct. I am sure it's lack of dredging that causes a lot of damage. So little water for the fish and easy for predetors to pick them off. Pollution may be the other issue. It's shocking to remember this river in its prime with 3 pound roach and 1 pound dace being common. Are Wild Carp being stocked anymore, as I see not on the list of nine? Hi Gary if its a chalk pit how can the carp be wild the only way they could get in there is stocking the lake with tame fish (they come when you call them for their dinner) from a fish farm. I used the Fish the River Great Ouse between St Ives and Huntingdon but There are so many cormorants coming from a lake close by that now you are lucky to catch anything bigger than 3-4 inches. Ten years ago I have had catches of 100lb of bream but those days are long gone. Also the weed clearing on the same river is a joke the agency send out weed cutters but they only cut the weed to about two foot deep. Sadly when our stretch of river was devastated by pollution two years ago we were basically told "no chance" when we asked for help. When we took on the lease my wife and i spent a week down there but realised it was to much of a job for two people so we had friends come and help we spent nearly a month removing rubbish, including stuff that gets thrown off the motorway and not just by people travelling..i've seen highway vehicles doing it but reports are ignored because i have no registration number, tyres, barrels, old baby buggies, beer crates and nearly 2 skips full of assorted junk, we put up bird boxes, bat boxes and planted meadow flowers etc... we even recieved praise from a wildlife group for the work we had done transforming the stretch. Then came the phone call, "There are hundreds of dead fish in the river mate", i rushed down there and started taking photos, yes tears welled as i took in what had happened and, what i knew i was looking at. The only advice from the EA, "you could sue the company" yeah sure, we are a tiny club (12 members) who have lost their only water due to pollution, as soon as the members saw the photos of the dead fish they left, leaving just four of us to keep the club alive, so yeah of course we can afford to sue an international haulage company. We kept in touch with the EA, asking questions etc and then after two years we're told "we have carried out a survey and found an abundance of fish"....love to know where because we have had professional fish finders on the go and underwater cameras recording for 12 hours and not a single fish has been found. Just remind me again.. what does my money get spent on? My apologies for such a late reply. It is the River Penk, in Staffordshire. The River was polluted from where it goes under the M6 at lowerdrayton lane, everything from there right down to its confluence with the River Sow at Baswich lane was killed. According to the EA a hundred fish were killed, my wife, my daughters and myself counted more than that before we gave up counting after 500yrds because there were just to many fish. How can you allow Cormorants that eat tons of fish per week to not be culled. Going down to canals and rivers and scratching for a good match weight is down to the untouchable Predators. I really feel for pond owners who are not allowed to shoot a predator that kills prize Carp that have taken years to grow !!! John A Birley. Match and pleasure Angler. to be fair to the EA lads it is natural England that deals with the cormorant culling licences not the EA! I too fish the river Dane,and just a you have found there are no longer any small fish,it is chub mostly I fish for and I have not had anything below 2lbs for the past five or six years. Are the chub no longer breeding? If it carries on as it is sooner or later the older fish will die off and there will be no fish to take their place. Fifty six years I have fished this stretch of the Dane and not known this happen before.